About 2 hours into our drive and 110 kilometers later along Jalan Kmpung Nyior (Dungun to Paka trunk road) we encountered flash floods, and the roads were inundated with what appeared to be knee-high flood waters. We braved our way through and made it to the other side of the ‘stream’ and proceeded make our way to Kemaman. We made a pitstop at our old favourite haunt, Kedai Kopi Hai Peng for a late breakfast. 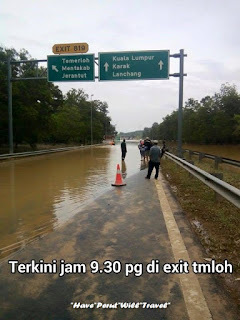 We then continued our journey and found our usual route to Kuala Lumpur, the Lebuhraya Pantai Timur (LPT) closed since massive flooding had rendered the expressway impassable along the Chenor - Temerloh – Lanchang route. 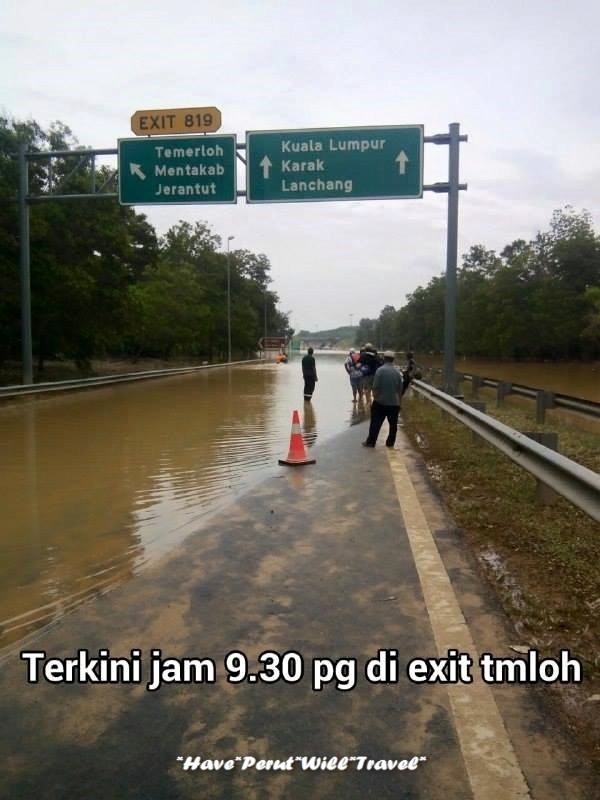 The old trunk road connecting Kuantan to Temerloh was submerged as well. We were advised to take the alternative route which was to head to Gambang first, then head south to Muadzam Shah, then west to Bahau before heading to Seremban before finally heading north to Kuala Lumpur. Reaching Muadzam Shah, we stopped at a petrol station for a biological break while filling up our car with petrol in anticipation of the long detour ahead. We reached Bahau at about 3:00PM and had a late lunch at a restaurant in Batu Kikir which was oddly called Tikey Corner. I couldn't help suppress a smile at the name and imagined its waiters and waitresses having a having a go at tiki-taka soccer while serving us. After our meal, the car developed problems and the gear could not shift up. We were stuck at a low gear and could only travel at about 30 kilometers per hour. A kind soul suggested that we try a workshop (Jit Sing) nearby. After almost an hour the mechanic at Jit Sing came to the conclusion that the car needed its entire gearbox replaced! We could not help but wonder if the flood waters we encountered at Jalan Kampung Nyior earlier this morning had anything to do with this? Jit Sing unfortunately did not have a gearbox at hand, and despite calls made could not procure a set from the surrounding area. After much discussion we decided to tow the car back to Kuala Lumpur to our regular mechanic. The tow costed RM550, while we had to take a taxi back to Kuala Lumpur as well which cost another RM110. This experience has taught us a very precious lesson: never underestimate Mother Nature's powers, and never assume knee high flood waters won't do serious damage to your vehicle.